Pretty much every year since we've been married, we have sent out photo holiday cards. Especially since we now have 3 kids, and have family and friends all over the country, I like to send photo cards so everyone can see how the kids are growing. I also love to receive photo cards!! I was recently looking at their new designs and was very impressed. One of the designs that I thought very clever was their minibook cards. These cards are 5x7" and are made up of 7 pages that can be customized with both pictures and text. One of the hardest things is choosing which pictures to include, and these minibooks would make that process so much easier. They also don't cost any extra postage to send. I also really like the ornament cards! I haven't yet chosen a design or even a picture for our holiday cards this year. I usually try to have it done by Thanksgiving, which is in just a few weeks. I know that Minted is one of the places I'll visit to make that final decision about this year's card! Do you send photo cards? 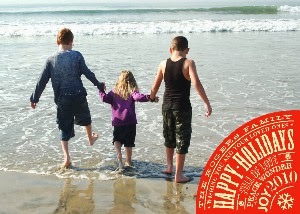 Have you taken your holiday photo yet? Let me know in the comments! I am Mom to a Teenager!